Two club records also fell, as 11-year-old Lilly Tappern continued her impressive form so far this year. 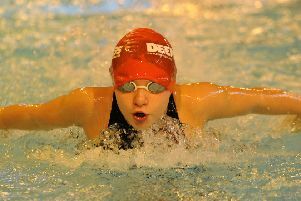 Lilly smashed a five-year-old Deepings record in the 200m butterfly, taking almost four seconds off the previous mark to win gold in 2.45.97. She also sneaked under the 200IM record time, collecting silver in 2.48.09. Both were also East Midlands Qualifying Times. Deepings’ girls were in dominant form in the individual medley across the age groups, with Lilly’s sister Amy Tappern bagging a brace of IM golds in the 16yrs/over 200m and 400m races. Also in the 200IM, Emma Wilde won silver (one of three over the weekend, together with the 200m and 400m freestyle) and Hannah Matthews took bronze in the 16yrs/O age group. Molly Briers picked up bronze in the 13yrs category and Holly Roffe won gold and Emma Dennis bronze in the 10/11yrs race. Holly, competing in her first long course 50-metre competition, had an outstanding weekend, achieving huge personal bests in all nine of her events. In addition to the 200IM gold, she won the 50m butterfly and took silver in the 50m freestyle. Also in the 10/11yrs age group, Emma Dennis won gold in the 50m breaststroke, silver in the 200m breaststroke and a brace of bronze medals (50m freestyle and 200IM), while long-course debutant Grace Edwards took bronze in the 200m backstroke. The senior members of the girls’ squad were in similarly fine form. Deepings girls’ club captain Holly Leggott won a hat-trick of gold medals in the 16yrs/over age group (50m freestyle, 100m and 200m backstroke), while Bethany Eagle-Brown cleared up in the butterfly events, topping the podium in the 50m, 100m and 200m butterfly, while also winning gold in the 100m freestyle. Completing the girls’ medal haul was Lorna McGill, with bronze in the 16yrs/O 200m breaststroke. The boys took their fair share of the spoils over the weekend. Ten-year-old Jacob Briers medalled in six of his eight events, winning gold in the 50m butterfly and 200IM, silver in the 200m freestyle and 200m breaststroke, and bronze in the 50m breaststroke and 200m backstroke. Alex Sadler won a pair of golds in the 12yrs age group, touching home first in the 200IM and 200m butterfly. He also claimed silver in the 200m and 400m freestyle, and bronze in the 200m backstroke. Harry Cardell completed the gold-medal performances with a massive 11-second personal best in the 15yrs 400m freestyle, finishing in 4.40.03, thanks to an outstanding display of underwater skills on every turn. Harry also won silver in the 200m freestyle and bronze in the 200IM. In the senior 16yrs/O age group, Louis Metselaar and Jake Jungmann shared seven medals. Louis won silver in the 50m and 100m breaststroke and 200IM, and bronze in the 50m backstroke and 50m freestyle, while Jake won silver in the 50m and 100m backstroke. Owen Sadler won the boys final medal of the weekend, with bronze in the 15yrs 200m backstroke. Lynn Chapman, Deepings Swimming Club head coach, was delighted with the team’s performance.